The Laos Wildlife Rescue Center welcomes animal drop offs, but they have never received anything quite as unusual as what was recently left at the Center. 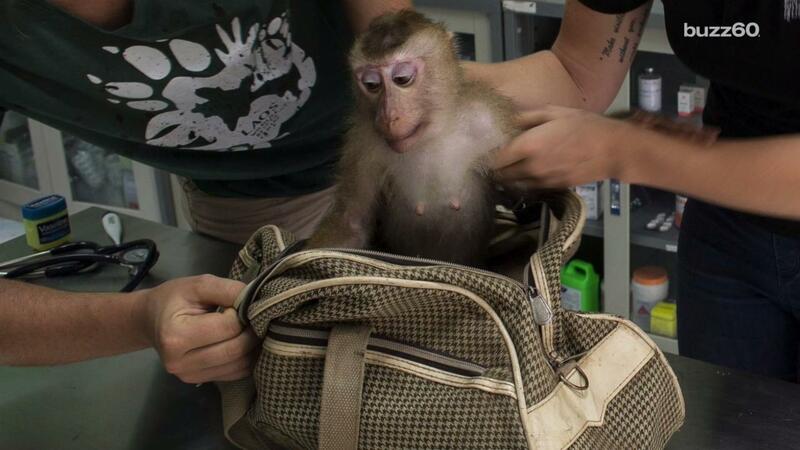 A purse was dropped off to a staff member, and inside was a small, timid monkey. When the staff member asked for paperwork and identification, the monkey's original owner said it was in the car and never returned. The Laos Wildlife Rescue Center noticed the monkey was wearing a chain, and was very kind and gentle. Unfortunately, she had not been cared for properly, and she appeared underweight and dehydrated. They identified Purse as a pig-tailed macaque, which is known to be a rather vulnerable species. Fortunately, Purse trusted the staff enough to allow them to remove the chain from her waist and provide her with proper care. They took her in and named her Purse, for obvious reasons. The staff has been hard at work to nurse Purse back to health. She is expected to fully recover from her malnourished state, and will spend her life at the Center where she will be kept safe.